For decades, filibusters served Congress well as a method for the minority to put some checks on the majority. But the nation’s founders never envisioned this turn of events. The constitution requires the VP to break Senate vote ties clearly indicating that 51 % is a majority. 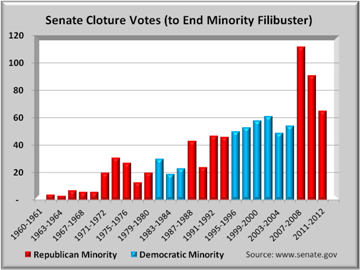 Republicans recent reliance on the filibuster has effectively raised the votes needed to pass to 60%, a super majority. Using the filibuster to wrestle power back is not a recipe to reduce people’s frustration with gridlock. This is a mid 2012 post updating earlier posts that record actual data through summer 2012. Americans of all political persuasions are more and more frustrated with the gridlock that has almost brought Washington to a standstill. This analysis focuses only on the Senate and the filibuster. The Senate posts filibuster data back to 1919. Records track three items. First, cloture motions to end debate which occur when a minority of senators threaten or actually filibuster. That sometimes ends the filibuster. Second, once a motion has passed, there is a cloture vote. Third is recording the cloture vote. If the vote succeeds, cloture is invoked and the filibuster is overridden. When a filibuster is overridden, then the Senate still has to vote on the actual bill. But then, only a simple majority or 51% is required for the legislation to pass. 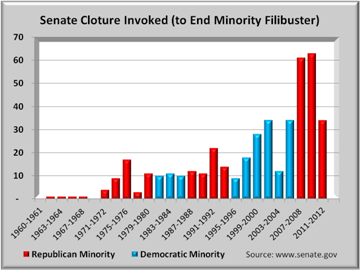 Republicans’ use of filibuster has reached unprecedented levels with no signs of abating. But it was not always so. 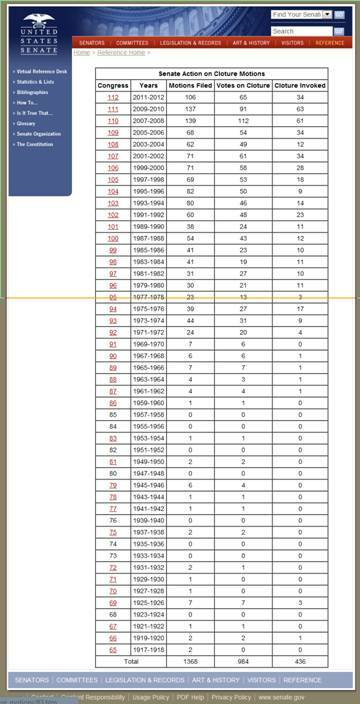 In the graph above, only 56 cloture motions were filed over 52 years from 1919 through 1970. At just over one per year, filibusters were rarely used. 420 cloture motions were filed over the next 22 years, from 1971 to 1992, a sharp increase to 19 per year. 1993-1994 saw Republicans’ “Contract with America” that escalated partisanship to higher levels. From 1993-2006, motions nearly doubled to 36 per year. 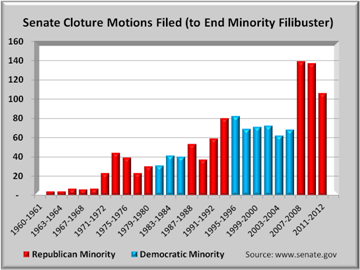 Cloture motions took an even more dramatic upturn in 2007 when Republicans lost control of the Senate. Cloture motions again jumped sharply through mid 2012 to average nearly 70 per year. Clearly, filibuster has become the weapon of choice for Senate Republicans. Republicans accuse Democrats of filibustering, and there is some truth to that. But as the graphs show, Republicans (red bars) initiated each spike and have now taken filibustering to an absurd new level. Virtually every major piece of legislation now runs the filibuster gamut. Motions to end filibusters is only the first part. The senate then needs to vote and this occurs about 75% of the time. Of those times when no vote is taken, either a compromise is reached or the bill is withdrawn. The graph below shows the trend in cloture votes taken. Americans hold Congress in low esteem because of gridlock. Americans want achievement, but that requires both parties to compromise. Neither party is blameless but neither is the blame 50/50. The frequency of filibuster and threats of it does not reflect well on Republicans’ acting in good faith. Credit Republicans with discipline. They threaten any of their own party who don’t tow the party line and vote out of office those who compromise, not in the general election but in the Republican primaries. While that increases the effect of their filibuster threats, it is essentially a negative strategy. They’re short on their own ideas. They’re adamant about their own ideas while they just say “NO” to all Democratic ideas. As the above graph shows, those filibustering do not always get their way. Since 1960, filibusters have been overridden less than 45% of the time. However, in the past 5 ½ years with Republicans filibustering, overriding those filibusters has succeeded almost 60% of the time. For decades, filibusters served Congress well as a method for the minority to put some checks on the majority. But the nation’s founders never envisioned this turn of events. The constitution requires the VP to break Senate vote ties clearly indicating that 51 % is a majority. Republicans lost majority through the ballot. Their reliance on filibuster has effectively raised the votes needed to pass to 60%, a super majority. It’s ironic that Republicans should blame Senate Democrats for not passing legislation, even though Democrats are in a majority. Using the filibuster to wrestle power back is not a recipe to reduce people’s frustration with gridlock.